Left - 10 in. VALENTINE - Original #14 Northwood pattern. Right - VALENTINE - 2.5 in. deep. Has Northwood trademark. 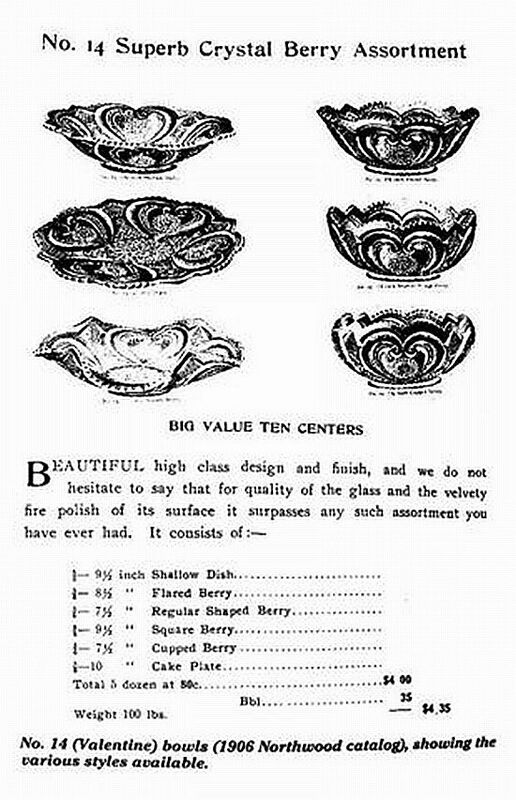 VALENTINE: First glance is mindful of the Jeweled Heart pattern by Dugan, but this extremely scarce pattern is a carry-over from the earlier glass era. The 1906 Northwood catalog page does not show this smaller size sauce. However, the intricate design within the marie is indication enough to securely place Valentine among the earlier artfully detailed patterns used for that era. 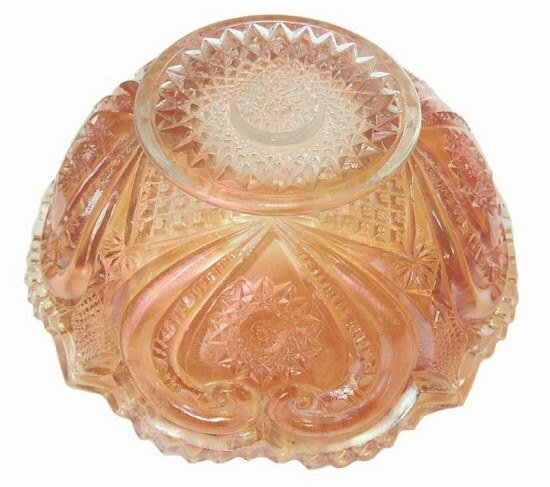 When carnival glass made its debut into a desirable market as early as 1907, the glass companies made selections from their stock of moulds to test their strength in the field of iridization. 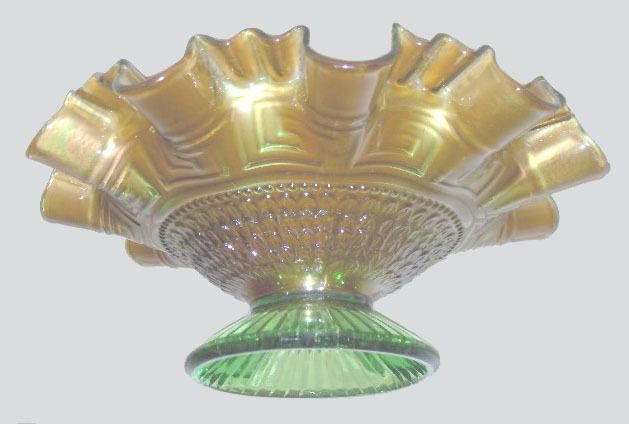 As newer moulds were made specifically for the carnival glass market, many of the earlier designs and those within the marie were eliminated, giving way to interior designs which are enhanced when iridized. 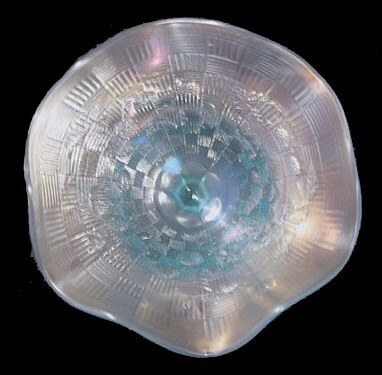 The master berry size is 10” x 2 ¼” deep, has the underlined N trademark and predates carnival glass to 1906 in the crystal glass period. 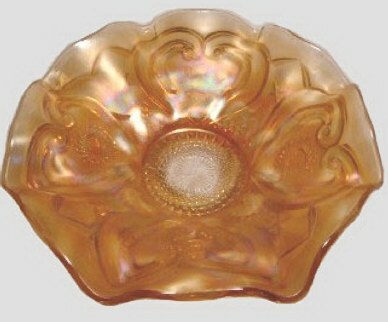 Carnival glass production run was very brief, making these marigold bowls nearly impossible to locate. This sauce diameter is 4 1/8” inside the bowl edge and is 4 5/8” outside the bowl edge, having a depth of 1 7/8”. 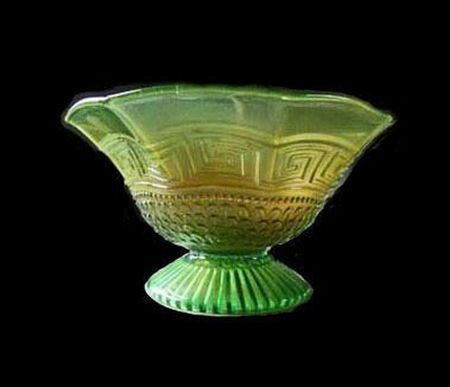 If John Resnik were still a part of the carnival glass crowd, he would label this “a rare-so-what”, meaning that it is not among the “recognized” rarities. Whatever you call it, we are proud to finally own this lovely specimen! It is our first opportunity to purchase one in more than 40 years on the trail, qualifying it as a “true rarity!” All to the good: the price for this rarity was not in the thousands of dollars range. 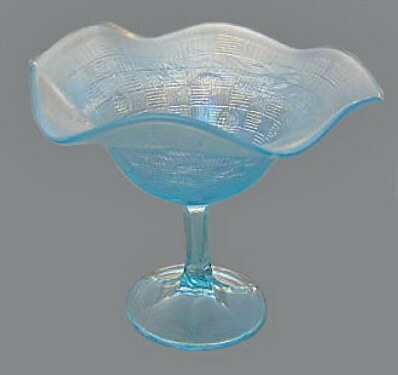 BLACKBERRY Compote: Ray and Lynne brought this “first known” example in ice blue to the attention of the www.carnivalglass.org. mailing list readers in late 2008. Since we have displayed several other fine examples from their collection, we appreciate their sanctioning the use of the photos seen here. It is interesting and offers further proof that the market in Australia was prime for testing this pastel color. 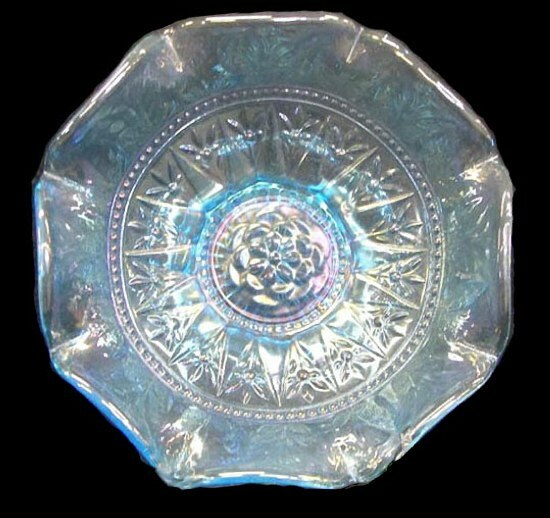 A number of first-known pattern examples in ice blue have originated there, such as Good Luck bowls and Petals compotes. It’s always a pleasure to own a “one-of-a-kind”, at least until another collector recognizes what to name his/her heretofore unnamed example. In clicking on - - in our pattern alphabet, you may view other examples in this pattern and BLACKBERRY & RAYS by Northwood. 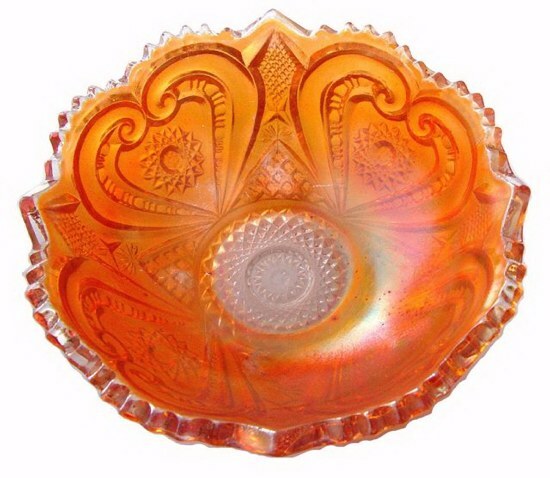 2nd known Marigold ELEGANCE Plate- $5000. 8-08. ELEGANCE Bowl in Ice Blue - $5500 - 8-08. 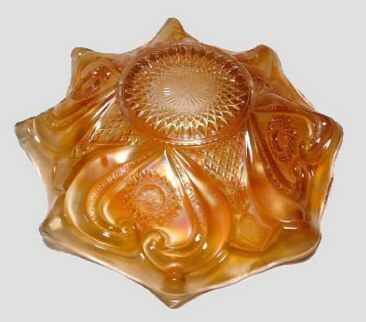 ELEGANCE: Please see ELEGANCE PERSONIFIED segment listed on the homepage to review the history of this pattern in depth. We merely want to show the two most recently sold examples, offered at a summer auction by Jim Wroda in 2008. GREEK KEY Variant - 8.75 in. x 3.5 in. high, with base of 3.5 in. diameter. 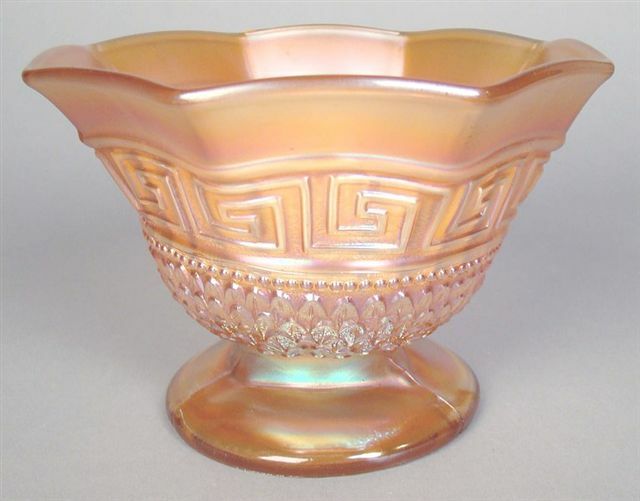 GREEK KEY Variant Bowl - octagonal shape in Marigold.- no ribbing. GREEK KEY Variant - Green, with Dome Foot. 7 in. wide at opening.- Mgld. and IB have no ribbing. 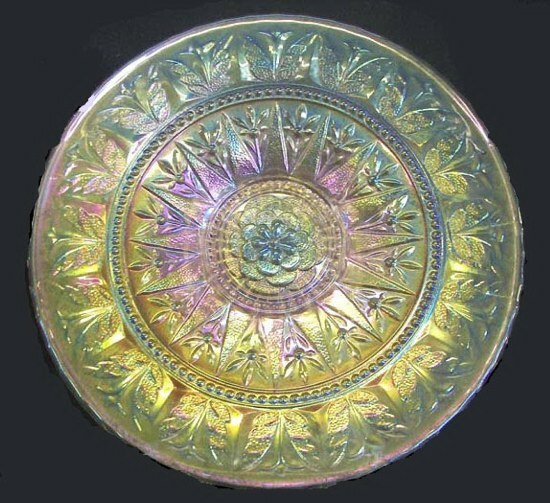 GREEK KEY Variant: Although this is an entirely different example of the Greek Key design found on 9” plates and bowls with basketweave exteriors, as well as handsome water sets offering Greek Key design on the exterior, these dome-footed bowls can offer a stippled rays interior or have no interior design. Colors known are: Amethyst/purple, green and marigold, with amethyst examples somewhat more difficult to locate. To get into heaven, it’s who you know that counts.